A yo-yo is a toy that has two disks connected together and sandwiching a long string. Traditionally made of wood, the disks are now commonly made of plastic. Attached to the center of the disks, the string winds, unwinds, and rewinds, while attached to a person's finger. The specific origin of the yo-yo is uncertain. Early versions of the toy have been placed in China, Greece, and the Philippines. The National Museum of Athens houses several vases dating from around 500 B.C. depicting young Greeks playing with discs tethered to a cord. The word yo-yo means come come in the native Philippine language, Tagalog, and yo-yos have been hand-carved in that country for thousands of years. The European introduction to the yo-yo occurred much more recently. The toy arrived in France during the eighteenth century, probably brought by missionaries returning from China, and it became a craze among the elite. The future king at that time, Louis XVII, was painted at age four with a yo-yo in hand. The French called the toy l'emigrette, after the aristocrats who popularized the toy and who were forced to emigrate to safer territories when the revolution began. From France the yo-yo traveled to England where again it sparked a craze among the upper classes. The English dubbed the toy bandalore and also quiz, and illustrations from the period show soldiers, aristocrats, and even kings playing with it. In 1927, a Filipino busboy named Pedro Flores began carving and selling a toy from his childhood to the guests at the Santa Monica, California, hotel where he worked. By 1929, the Flores Yo-yo Corporation had two factories in Los Angeles, California, feeding a craze for the toy that was sweeping across the United States. Flores' yo-yo utilized a unique innovation, the slip string. Previous designs had the string tied to the yo-yo's axle, and so the yo-yo would only go up and down. With Flores' design, a twisted length of string looped around the axle, allowing the yo-yo to spin or "sleep" so that various tricks could be performed. Soon Flores' spinning top attracted the attention of marketing genius Donald Duncan. Duncan opened a Flores Yo-yo factory in Chicago, Illinois, and soon after, he bought the company. To promote his new purchase, Duncan staged yo-yo contests in cities across the country. The yo-yo became a nationwide craze; one 30-day campaign in 1930 sold three million of them. A shortage of wood and labor put the yo-yo on hiatus during World War II. When production restarted in 1947, Duncan was not alone in the market. For years, the company was able to maintain an edge over the competition with a fierce defense of their trademark on the name yo-yo, forcing competitors to give their toys names such as return tops or Filipino twirlers. In 1962, the yo-yo reached new heights in the United States, selling 45 million units in a country that only had 40 million children. Feeling that they were in a position to finally take back the market, Duncan sued its chief rival Royal Tops for trademark infringement. They lost. The court ruled that Duncan could not legally hold a trademark on the name yo-yo because it was, and always had been, simply the name of the toy, like kite or baseball. Three years later, deeply in debt from court battles, expensive television promotions, and the cost of retooling production lines from wooden to plastic yo-yos, Duncan was forced by its creditors into bankruptcy. In 1968, Flambeau Plastics Company bought the Duncan name and restarted production; the company still makes Duncan yo-yos today. The Greeks fashioned their discs from terra cotta. The French emigrettes were ivory and brass. Philippine yo-yos are carved from water buffalo horn or from wood. Until the switch to plastic in the late 1960s, American-made yo-yos were carved from solid blocks of maple. Most modern manufacturers of wooden yo-yos still use maple as it has the ideal density to give the yo-yo the proper weight at the required size. But 90% of the yo-yos sold today are plastic. Manufacturers use a plastic called K-resin. K-resin takes color well, is non-toxic, and is resilient enough to survive repeated abuse, but soft enough not to develop sharp edges. The string is, and has been since 1927, pure Egyptian cotton. Recently, some manufacturers have introduced synthetic strings, but these do not maintain the proper friction against the inside of the yo-yo and against the axle and will not perform properly. Traditionally, the axle was made out of the same wood as the sides of the yo-yo as the toy was carved out of a single, solid block. While wood provides ideal friction against the string, this friction eventually causes the string to cut the axle. And a broken axle cannot be repaired. So most modern axles are made from either aluminum or steel. A yo-yo functions on the two basic physical properties of friction and rotational inertia. Rotational inertia says that a spinning object will resist moving from the axis on which it is currently spinning, which is why a yo-yo will descend and return in a straight path rather than twisting and twirling on the end of the string. It also means that the object will continue spinning until some other force—usually friction—stops it. The friction in a yo-yo comes from the contact of the string with the inside surfaces of the two halves and from the contact of the string with the axle. Decreasing the diameter of the axle reduces friction, allowing the yo-yo to spin longer, giving more time to perform tricks. But if the axle is too small, the yo-yo will not return properly. The distance between the two halves requires similar considerations; widening the gap decreases the friction against the string and allows the yo-yo to spin longer, but that friction of the string against the sides as the yo-yo descends is part of what makes the yo-yo spin. The width of the string has the same effect; a thicker or thinner string is essentially the same as a wider or narrower gap and will produce the same results. In addition, yo-yo string is designed to have a natural twist so that it will not unwind and let loose the yo-yo. But if the string is given too much twist, the end loop will wrap too tightly around the axle and stop the yo-yo from sleeping. Rotational inertia increases as weight is distributed to the outside rim of the spinning object. A bicycle wheel, for example, has a lot of rotational inertia so it spins for a long time and is very stable while it spins, ideal for a yo-yo. Unfortunately, a yo-yo the size of a bicycle wheel is difficult to hold in one hand and is almost impossible to throw, so most yo-yos are made considerably smaller. Considering all of these variables, each yo-yo manufacturer arrives at a different conclusion about specifics, usually varying by a sixteenth of an inch (0.16 cm) in any dimension and a sixteenth of an ounce (1.75 g) in overall weight. But they all end with the same basic conclusion, a yo-yo that weighs about one and three-quarters ounces (49 g) and is about two and five-eighths inches (6.67 cm) in diameter. Each half of a plastic yo-yos is composed of two parts, the outer shell and the inner disc. These two pieces are snapped together, and an axle joins two halves to form a yo-yo. the making of a wooden yo-yo because wood warps and shrinks as it dries, which is something that should happen before it is carved into the specific, balanced shape of a yo-yo. Once dried, the lumber was cut down to size. It was then put on a lathe and, using a master pattern to ensure the correct dimensions, it was shaved with a variety of chisels into a yo-yo. The yo-yo was either stained with wood stain or painted, and then it was finished with clear lacquer. 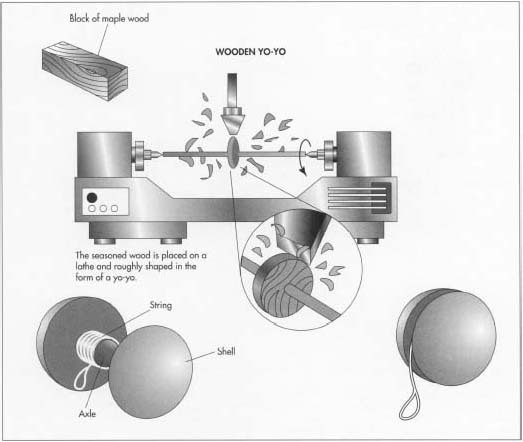 Today, most manufacturers of wooden yo-yos still use this process except that very few make solid yo-yos anymore. Most drill into the wooden halves and connect them with a steel axle. However the majority of yo-yos made today are of plastic. That process has nine steps. 1 Each half of a plastic yo-yo begins as two pieces: the flat, inner piece that will take the axle is called the disc, and the rounded outer piece is called the shell (the butterfly type yo-yo is opposite, with a rounded disc and a flat shell. It is made via the same process but on a separate assembly line). The plastic used to make the discs and shells is fed in the form of solid pellets into a huge funnel with an equally huge screw inside. The outside of the funnel is wrapped with flexible strips called heater bands, which are like narrow electric blankets for the funnel. Each band gets progressively warmer as the funnel gets narrower, and as the screw pushes the pellets toward the bottom of the funnel, they become more and more liquid. This process ensures that the pellets will melt evenly and completely, which is critical to the next step. 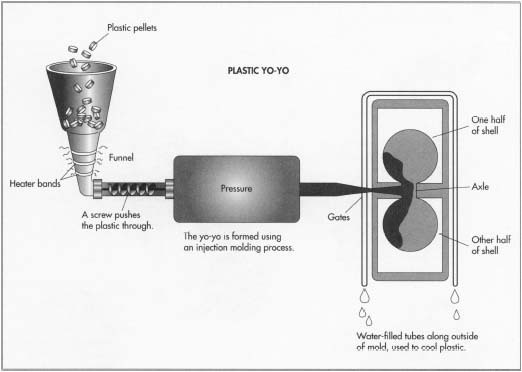 At the bottom of the funnel, the screw pushes the liquid plastic into a mold through a tube called a gate. Wooden yo-yos are made from lumber that has been dried to ensure the finished yo-yo will not change shape. Modern wooden models have two wooden halves that are connected by a metal axle. filled. Because the mold is completely filled and because the plastic has been entirely and evenly melted, each shell and each disc will always be perfectly round and have perfectly even weight distribution. Once the mold is filled, it holds the plastic for 17 seconds and cools it with water-filled tubes running along the outside of the mold. Then the mold, which is actually two halves clamped tightly together, releases the shells and halves, all connected by the plastic that filled the gates, onto an assembly line to be fashioned into yo-yo halves. 3 While the molding line is making yo-yo halves, a separate machine is cutting the axles to connect them. The machine is fed long pieces of round metal. The exact length of metal to make an axle is fed into a clamp where it is cut. The cut piece is then notched at each end so that it will grip the plastic. 4 Once the mold releases the flat of shells and discs, a worker clips them apart, removes any extra plastic and snaps them together to make halves. Each shell and disc has a lip that fits into its complimentary piece. When the plastic is still slightly warm from the mold, these lips will snap together. Once fastened, they will not release. 5 The halves are sent down a belt to a machine called the hot stamper. The hot stamper has a circular tray with cup-like holders around its edge. Each holder takes a yo-yo half and rotates it to a heated press. The press feeds a roll of whatever logo the yo-yo will display onto the top of the yo-yo half. It then presses the logo onto the half and heats it, affixing the logo. Other designs use a round insert displaying the logo which fits into the disc and a clear shell so the insert can be seen. 6 The halves continue down the line to a worker who places an axle in one half and sets it with a mallet. The next worker places the other half on top and sets it with a mallet. Then the assembled yo-yo is placed in an air-driven press. The press has a tray in the shape of the yo-yo and a metal plate that fits between the yo-yo halves. The metal plate has a groove cut out to fit around the axle and is the exact thickness of the manufacturer's specified gap between the halves. When the press fires, it both permanently secures the two halves to the axle and sets the correct gap between the halves. 7 The finished yo-yo is now placed on a table with a spool of string and a cutter at one end and an upright, with several notches in it at the other. The distance between the cutter and the upright is exactly the length of the manufacturer's desired length of string for each yo-yo. The string is pulled down from the spool through the notch in the upright, where it is looped around the axle of the yo-yo. Then it is pulled back to the cutter, cut, and tied. The yo-yo is then allowed to hang from its string, held by the notch in the upright, to twist onto the axle. 8 The strung yo-yo moves down the line to a machine that resembles a miniature turntable. A worker places the yo-yo on the wheel, holds it down with one hand, holds tension in the string with the other hand, and with a foot-operated switch, spins the string onto the yo-yo. 9 The most common packaging for a yo-yo is called a skin card. The skin card is the cardboard sheet with the product attached to it with what appears to be melted plastic wrap you see hanging on store displays. To package a yo-yo this way, a sheet of several cards is slid under a piece of wood with holes in it corresponding to the cards below. A yo-yo is dropped through each hole onto the card. This assures correct placement on the card. The sheet then moves on rollers to a machine that feeds plastic film over the entire sheet of cards and yo-yos. The film is made from a special plastic that conforms to any shape and shrinks when heated but does not melt. The machine heats the plastic, which tightly seals the yo-yos to the cards. The machine then cuts the sheet into individual cards and rolls them into a basket where they are collected and boxed for shipping. The foremost modern advancement to yo-yo design was Pedro Flores' creation of the slip string. Some would argue that the advent of durable metal axles was an advancement. Others say that only wooden axles offer the proper friction to make a truly playable yo-yo. San Francisco yo-yo entrepreneur Tom Kuhn has invented a system that addresses both durability and spin. His yo-yos have a replaceable wooden sleeve that fits over a steel axle. His latest creation replaces the fixed axle altogether. It uses the same sealed bearing on which computer disk drives spin and is said to sleep 10 times longer than a conventional axle. But the basic design of yo-yos is the same as it has always been. And barring some radical change in the laws of physics, that design will never change. Cassidy, John. The Klutz Yo-yo Book. Klutz Press, 1987. Malko, George. The One and Only Yo-yo Book. Avon Books, 1978. Zeiger, Helane. World on a String. TK Yo-yos, Ltd., 1989. Crump, Stuart, ed. Yo-yo Times. Creative Communications, Inc.
Kowalick, Vince. "Yo-yo Entrepreneur Had to Pull Some Strings." Los Angeles Times, May 23, 1994, pg. 5. "SoCool…Sonoma County ONLINE…Just Say Yo." http://www.socool.com/socool (1/29/97). "The American Yo-yo Association Home Page." http://www.pd.net/yoyo (1/29/97).